The five countries of the Greater Mekong – Cambodia, Laos, Myanmar, Thailand and Vietnam -- face a bold choice in the coming years: leapfrog and embrace the best clean, renewable technologies now or continue an overreliance on heavily polluting, high carbon fossil fuel power generation, non-sustainable hydropower projects or a dependence on risky and costly nuclear power. Greater Mekong countries have a unique and timely opportunity to become leaders in clean, renewable electricity. Renewable energy sources such as sun, wind, water, geothermal, biomass, and ocean energy abound in the region and are increasingly becoming more affordable, more available and more efficient. WWF and a host of partners in all five countries have developed a vision for renewable energy in the Greater Mekong Region that lays out a roadmap for a future run entirely on renewable energy by 2050. Through a regional plan and then five specific country level plans, The authors of this vision set out sensible, cost effective solutions to some of the region’s most taxing energy problems. The goal is to spur a regional and global debate, as well as concrete actions, leading to an achievable, affordable renewable energy future in the Greater Mekong. A sustainable high renewable energy uptake approach can ensure electricity cost stability and maintain system security – that is, provide enough electricity at all times to make sure there’s never a risk of the ‘lights going out’. The sustainable energy scenarios are 100% possible: they rely on realistic projections for proven technologies, and are economically competitive with “business as usual”. 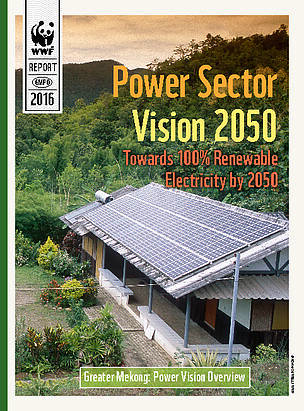 WWF worked with Intelligent Energy Systems (IES) and partners across the region to develop the most ambitious and detailed analysis of the Greater Mekong's power sector vision to date. The reports are broken into two parts: for each country and the region as a whole, Part 1 gives an overview of the power sector vision and Part 2 takes a deeper look at the technical details.